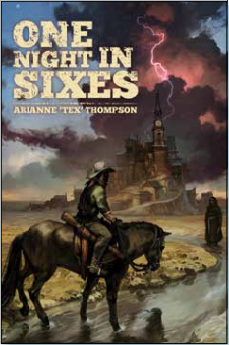 The Tex Files - Home of Arianne 'Tex' Thompson: "One Night in Sixes" Available for Pre-Order! "One Night in Sixes" Available for Pre-Order! Not gonna lie, y'all. It's pretty freakin' exciting. One Night in Sixes is available for pre-order on Amazon.com! --right now it's mass-market paperback only, but the ebook version will be forthcoming. Thanks ALL y'all who have already lent your attention and enthusiasm to this thing. Soon, the lightning will strike and the current will arc and it will LIVE! Don't know if I'm elated or gassy, but I'm somewhere in that zone. I'm excited for ya and wishing you a tremendous success!!!! Thx dude! You and your rockin' raptor are far too good to me, but I will take it two-handed and thank you kindly! Carted and awaiting July 29th. MUCH love, Frankles. And warm hippy hugs from TX while we're at it - don't get buried up there! Dude, I owe you waaaay more than that. I'll make good on it at ArmadilloCon - this time for real! I read the blurb. What a totally unique concept. I'm stoked about the release! Congrats on making it! I just added "One Night in Sixes" to my to-read list. FYI, having been in a band for some time, I've gotta tell ya. Pretty brave of you to offer to sign ANYthing. People will take you up on it! Hahaha, something tells me you've got a hell of a story or three up your sleeve (and given that latest Silexare anecdote, I can only imagine they are all five-star humdingers!) Thanks for Goodreads add and the vote of confidence, buddy - it means more than you know!